As many office workers can attest, one of the most important parts of each day is figuring out where to have lunch. This exercise can start as early as 9:15 in the morning. Unfortunately, my co-workers and I would often have this decided by 10:30 am and still have to wait an hour and a half until we could put our plan into action, stomachs growling all the while. HB Burger on 43rd between 6th and Broadway. Get there early, because it fills up quickly. Not cheap (to be expected, this close to Touristlandia), but I really liked the atmosphere and the bison burger. Sophie’s Cuban Cuisine (warning! clicking this link will cause Cuban music to play loudly through your browser) on 45th between 5th and 6th. My Jamaican colleague was very happy when we found this place. You can get a HUGE meal for lunch prices, or you can opt to get a couple of empanadas. Seating is available if you get there early enough. Mai Sushi, on 41st between Madison and 5th. Another colleague discovered this for us one day, and we were thrilled for the new option. Affordable yet yummy sushi, with plenty of non-sushi options for those who want something else. Great miso soup. Excellent selection of affordable, prepackaged “to go” boxes. Though I typically stayed in hotels in Midtown, I just happened to be staying in TriBeCa the week of May 1. When I landed at LaGuardia, the president had already made his announcement about the death of Osama bin Laden. I turned on the TV as soon as I got to the hotel room. MSNBC was showing footage of college-aged people gathering in a celebratory fashion in front of the White House, and Brian Williams was reporting that people were also gathering at Ground Zero. When I realized that I was less than a mile from the site, I felt a responsibility to go and check out what was happening (even though it was past 12:30 at night at this point). I don’t know what I was expecting – a vigil? a rally? a media circus? but I knew I should take advantage of being there. 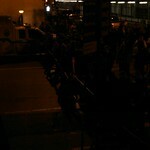 12:50 am: I walked down to the WTC site to see what is going on. A crowd has taken over the street but NYPD is trying to keep it from getting any bigger. 1:11 am: I made it to the crowd by going around the block. It reminds me of a mosh pit. 1:13 am: People are chanting various things, including “USA”, “NYC”, and “Yes We Can”. 1:17 am: There seem to be a few 9/11 families but mostly college age people (of which more than a handful are drunk). 1:17 am: Cigars are being smoked. 1:20 am: Some guys were singing “Proud to be an American.” Now it’s stuck in my head. 1:21 am: The police are losing their barricade battle a few yards at a time. They’re doing their best to keep things contained. To fill in a few things: when I got there, the corner of Church and Barclay was barricaded off, and the police weren’t letting anyone pass. I tried to go around to the west, but that wasn’t the right way to go. I finally went back and to the east, and found that people had gathered on Church and Vesey. When I was leaving, the NYPD had taken down the barricade at Church and Barclay, but were trying to prevent people from walking down that block of Barclay altogether. There wasn’t much media there when I got there, but by the time I left, I saw journalists in the middle of the crowd, interviewing people. There was a news van parked on Vesey when I left (I’m not sure which network it was… perhaps local). It didn’t seem to me that the crowd had much purpose in being there – as though people had heard the news and just decided they needed to be with other people. There was really no focal point to the crowd, and even the chants seemed to occur spontaneously from various areas. I didn’t get good pictures, because it was dark, and – let’s face it – I was shooting with a BlackBerry. But I tried to take some video, and this video turned out okay enough to give a sense of the situation. There was an Op-Ed in the New York Times a few days later that I felt did a good job of explaining why groups gathered at the WTC site, at the White House, and elsewhere. There was quite the media circus a couple of days later when Obama came to visit. On our way back to Maryland from visiting friends in Richmond, we stopped for a quick hike in Prince William Forest. It’s convenient and easy to get to – just off I-95 next to the Marine base at Quantico. There’s a $5 fee (a bit of a hassle because you have to go to the Visitor’s Center first to get a little receipt), a drop in the bucket to help defray the costs of maintaining the park. Of course, silly me, it should have been free because we JUST bought a National Parks pass – but of course I had left it at home. Prince William Forest isn’t anything particularly special, but it’s nice to have a large chunk of protected forest land (15,000 acres) with many different trails and bike paths. The park also features campgrounds and picnic areas. Dave also learned in the Visitor’s Center that there are various small, historic cemeteries located in the middle of the forest, which are difficult to find unless you’re with a ranger (or you just stumble across one). We hiked a trail called “Farm to Forest”, which got its name because that particular spot was once a farm, and has now been allowed to return to wilderness. I was aiming for a 1.7 mile hike, but once we got there, we realized that there were really two trails – a 1-mile loop, and a 1.7-mile extension. So, we ended up hiking more like two and a half miles. Fine for me, but maybe a little much for Lucas, since his elbow’s not 100% yet. It was a very nice hike, and it was perfect weather. It was labeled as “moderately strenuous”, which really means it’s perhaps on the slightly strenuous side of “moderate”. There were a few ups and downs, but no major inclines or much elevation change. The trail ran along and/or crossed Quantico Creek for the middle part of the hike, which wasn’t as scenic as you might think. The best feature of the trail was all the evidence of beavers – we had never seen so many chewed trees. The beavers had obviously been quite successful, actually, because a number of the tree trunks had been chewed all the way around and had fallen. There were one or two very effective beaver dams on the creek as well. Unfortunately we didn’t actually spot any of the critters. If you live in the DC area and are looking for a place for a quick hike, or if you’re visiting the area and are looking for a place to camp near the nation’s capital, check it out: http://www.nps.gov/prwi/. Today’s adventure was to visit Luray Caverns, in Luray VA. It is the largest caverns in the Eastern U.S., and is advertised as the most popular. We left Silver Spring around 10:30 am, and drove out I-66 to I-81. We got off the freeway in New Market, VA, and had lunch at a place called “Southern Kitchen”. It was a typical diner-style restaurant in a small Virginia town, which was really fun. The waitress was really friendly, the clientele were fun (though our presence lowered the average customer age to about 55 years old), and the food was tasty and affordable. Unlike while in DC, I could just order sweet tea, instead of first asking if they had it. From there it was 15-20 minutes to Luray Caverns. We turned off Route 211 to find a much larger complex than I’d expected. In addition to the Garden Maze, which I was already aware of, there were a number of buildings. The main Visitor’s Center for the cavern itself seemed large from the outside (though, once inside, both the lobby and the meandering gift shop were cramped and the space not well-organized). There was also a cafe, a country store, a fudge shop, a “Car and Carriage Museum” (I’ll get to that later), and a small building with extra restrooms and vending machines. Oh, and a gas station at the outside corner. Maybe I was just expecting a hole in the ground? The tickets are expensive ($21) but the cavern itself was worth it. Although the promo materials suggest that the tours are guided, it’s actually an audio tour. This is actually preferable, because the cavern’s visitors are all types. Best to go at your own pace anyway. Luray Caverns has a lot of different formations (which they refer to as the cavern’s “decorations”). It was quite impressive. Our favorite part, by far, was an area called “Dream Lake”. It was spectacular – a shallow lake inside the cavern that acts as a perfect mirror of the stalactites above, making it seem as though there is a perfectly symmetrical area of the cavern. It was truly impressive. Caverns are hard to describe. If you enjoy them, you should visit Luray. [Of course it’s nothing near as impressive as Carlsbad Caverns in New Mexico, but that’s hard to top anyway.] If you’re claustrophobic, you probably already know not to bother. What’s fun about caverns is that it’s probably the best opportunity you’ll have here on Earth to feel as though you’re on another planet. After we finished the mile-and-a-quarter meander through the caverns, spending more time than one might think possible looking at stalactites, stalagmites, columns, draperies, etc., we ended up in (guess where?) the gift shop. We poked around there for a bit, and also in the general store. Admission to the “Car and Carriage Museum” is free with admission to the cavern, so we figured we’d breeze through. As the name suggests, it has on display a number of automobiles and old carriages (you know, horse-and-buggy type things). They had an admirable collection of vehicles from the early 20th century, including of course the Ford models T, N, and A, and also a few sweet-looking Rolls Royces. The museum design, however, was SUPER cheesy and dated. It was filled with mannequins that were creepy, old, and had pieces of their skin chipping off. You could tell that the signs describing the different vehicles hadn’t been updated for a while – one described the company founded by Ransom E. Olds, i.e., Oldsmobile, as one of the few original companies that had managed to survive our tough economic times. Oops. We survived that, and ended up in yet another gift shop. We bought some fudge and hit the road. We took the scenic route back – Skyline Drive. This is actually the heart of Shenandoah National Park, which we hadn’t realized was a fee-only area. So, we bought an annual pass, figuring we’ll probably be visiting some national parks later in the summer anyway. Unfortunately it wasn’t ideal weather for a scenic drive. The Blue Ridge Mountains were largely covered by low clouds all day, so we drove through fog for about half the drive. There are a number of beautiful scenic overlooks on both the east and west sides of the Blue Ridge… but we couldn’t see much from some of them. There were a couple of spots where the clouds weren’t sitting on us, and Dave was able to take some photos. But, it was peaceful and beautiful and relaxing. Clearly this is the place to be in the fall, but no doubt it’s a never-ending ant line of cars when the foliage is changing. It took us a while to get home, because as soon as we got on the Beltway, we came to a dead stop because of an accident that was blocking 3 of 4 lanes. Welcome back to civilization! As we have only three months left to live (here in DC, that is), we have compiled a list of things we must see/do before we move. Very high on the list was Frank Lloyd Wright’s Fallingwater, which is in southwestern Pennsylvania (closest large town is Uniontown, hometown of my dear friend Susan). Fallingwater is one of his most famous works, if not the most famous. Only a few miles away is another home he designed toward the end of his career, called Kentuck Knob. Today we took a day trip to see both. It took us about 3 hours to get there, up to the Maryland/Pennsylvania border, across the tiny sliver that is northwestern Maryland, then up across the border into Pennsylvania. It was an easy drive with little traffic on a Friday morning. As we neared Fallingwater, we drove through Ohiopyle, a cute adventure town on the Youghiogheny River. I had flashbacks to a whitewater rafting trip I took with some WIC folks about 10 years ago here on the Yough. Even though today was a grey day, the whitewater was tempting me back. We got to Fallingwater around 11:30 am. When you arrive, you drive onto the grounds and come to a gatehouse. Here is where they take your money. You are then directed to a parking lot a few hundred yards later, which is in front of a visitor’s center. There you find the tour booth (where you schedule the tour that you already paid for), the cafe, the gift shop, and the restrooms. Once we got there, we oriented ourselves, then ate a quick sack lunch in the car (no picknicking on the grounds). Then we poked around a bit before putting in for a tour time. There is a short nature path that loops around from the visitor’s center, and from the midpoint you find a fairly nice view of the front of Fallingwater. In a somewhat concentric semi-circle is another path, which goes from the visitor’s center, past the house, to a little spot called “The View” (not to be confused with the ridiculous TV show) where you can get the “signature shot” of the house, and then back up to the parking lot. We spent some time taking all this in (and Dave took MANY photos) before heading back up to get our tour time. Our tour group was about 14 people, which was a manageable size. The tour guide was okay but not stellar – he gave us a pretty straightforward tour of what was there, and didn’t offer a lot of architectural teaching or trivia about either Frank Lloyd Wright or the Kaufmanns (the original owners). Though the tour was not educational as far as learning much about Wright or his process, the house itself pretty much speaks for itself. Fallingwater is built on top of a waterfall. My favorite feature of the house is a stairway that goes from the bottom level of the house (the main/living/dining room) down into the stream. Not to the side of the stream – right into the middle of it. Very cool. Dave’s favorite part of the house was also in the main room – the fireplace. Aside from being a huge, cool hearth, the fireplace is an amazing example of Frank Lloyd Wright’s tendency toward organic architecture. Rather than move natural features out of the way when building a home, he would design around them. In this case, a large boulder seems to come up out of the floor in front of the fireplace. On the other side of the wall, it protrudes in a natural way from the outside of the house. The tour lasted about an hour long, taking the group through most of the rooms in the house, as well as the guest house above it. It ended with a video explaining why the house had been donated by the Kaufmanns to the Western Pennsylvania Conservancy and why we should give them money. I don’t know why I was caught off guard by the plea for money, but I was completely not expecting it. It wasn’t terrible, though. We poked around for a bit more and Dave took a few more photos of the exterior (no indoor photos were allowed). Then we talked to the lady in the tour booth and got ourselves a reservation for the 3 pm Kentuck Knob tour. It was a short drive back through Ohiopyle and up a hill, and we found ourselves on the grounds of Kentuck Knob (aka Hagan House, after the original owners; aka Chalk Hill, after the location). We bought our tickets and had about 15 minutes to kill, so we poked around in the gift shop. Then a shuttle bus took the tour group (about 10 people) up to the top of the hill and dropped us off in front of the home. Kentuck Knob is quite a bit different from Fallingwater, but no less cool. It is situated near the top, but not quite on top, of a hill. Apparently Frank Lloyd Wright didn’t believe in placing houses on top of hills (where they would dominate the landscape) but instead liked to build them into the hill (where they would be an organic part of the landscape). Even with this design concept, though, Wright created beautiful vistas throughout the home. This home is actually still privately owned, but the owners allow the Conservancy to use it for tours. They don’t live there, but use it sometimes for parties. A lot of their belongings are still in the home. Kentuck Knob is a lot quirkier and more homey than Fallingwater. There’s not a square room in the house, the design of which instead incorporates hexagons, parallelograms, and trapezoids. A geometry teacher’s dream! There were a number of beautiful features that are difficult to describe, particularly the “invisible window” in the main room, which does an amazing job of bringing the outside in, and vice-versa. I also loved the hexagonal kitchen, which the rest of the folks on the tour group seemed to think was very small, but for me and Dave was spacious, and had a ton of cabinet and counter space! Our tour guide at Kentuck Knob was not only very good about sharing knowledge about the house and Wright’s work in general, she was also very intentional about getting everyone’s names. At the end of the tour she thanked us all by name and asked us to enjoy the rest of the day. The original owners of the home were avid art collectors, and they had a number (and variety) of sculptures they had situated around the grounds, including a “sculpture meadow”. We walked down from the house back to our car near the visitor’s center and enjoyed the different pieces. The most fun was called “The Red Army”. There were also a couple of panels from the Berlin Wall – one of which was a bit buried in the woods, but the other was part of the sculpture meadow and could be viewed up close. We headed out by 5:30 pm and drove home, stopping in Hagerstown for some Chick-Fil-A (as the cows say in the ads, “Eat Mor Chikin”). We finally got home around 9 pm. A completely doable trip in a day. Considering that we live just outside our nation’s capital, we couldn’t pass up the opportunity to see Barack Obama become president. We woke up at 5 a.m. Our friend Sarah met us at our house a bit before 6 a.m. Once we were finally ready and had taken Lucas out, we headed for the bus, a little after 6 a.m. We took the bus to the Silver Spring metro station, and the platform was already packed! Fortunately, we made our way to the very end of the platform, and were able to get on the very last car, which was fairly empty. We took the Red Line to Fort Totten and transferred to the Green Line. The sun was just starting to light up the sky. We figured that rather than entering the Mall on the side of the parade route (where there were security checkpoints and it would be harder to cross over toward the Mall), we should enter the Mall on the other side. Things went smoothly getting on the Green Line (we even got seats!) and got off at L’Enfant Plaza, which is just a couple of blocks from the Mall. It took us an hour to get out of the Metro station. The place was packed, and they had to close the escalators out of the station because someone had a medical problem. That meant that people had to walk up the escalator, many of whom really weren’t fit enough to do so. This caused the entire station to get backed up. The station staff were managing it in a pretty hands-on way, and ended up letting everyone exit without swiping out. Still, it took a long time to get out. We then had to walk from L’Enfant Plaza toward the Mall, down Independence Ave, to 14th Street. Along Independence, there were law enforcement officers and military personnel trying to keep the street open for VIPs to drive toward the Capitol. A couple of sets of cars passed us as we walked. The first set was four normal-looking cars (as opposed to presidential motorcade-like cars). The first car was John McCain driving himself and Cindy! The rest looked to be other congresspersons. The second set of cars was a couple of escorted black SUVs with tinted windows – couldn’t see who was inside. Then the live pre-show entertainment for the actual inauguration ceremony got started. There were a couple of choirs, then military bands. They also showed footage of all the various dignitaries arriving to the Capitol, and also entering into the VIP seating area. Finally it got started! We were surrounded by some characters who were providing their own commentary, but they were harmless and not too annoying. The crowd did some booing when George W. came out, and chanting “Na na na hey hey goodbye”. But there wasn’t too much of that. The crowd cheered, waved flags, and applauded (mostly with gloved hands) when Obama came out! The crowd had a mostly very good vibe, and was of course very excited about Obama. When Rick Warren came on, I was worried that there would be a negative reaction, but the crowd was respectful (except for 1-2 people booing). His invocation included a lot of really good thoughts, but it was a lot longer than I expected, and I was surprised (though not unpleasantly) that he ended with the Lord’s Prayer. Aretha Franklin sang, and was of course awesome. It was a thrill to see Joe Biden sworn in as Vice President, and then there was a quartet including Itzhak Perlman and Yo Yo Ma, playing a piece that John Williams arranged for the occasion. Then, finally, Barack Obama was sworn in as our 44th President! I was surprised to see him mess up the beginning of the oath. But he recovered, finished strong, then gave his inaugural speech. It was really a wonderful speech, and set just the right tone for the occasion. Sarah pointed out, “Americans have short attention spans.” After the speech, people started wandering off. There was of course still a bit left in the program – a pretty cool poem by Elizabeth Alexander, and a (quite long) benediction by the Rev. Dr. Joseph Lowery. Then it was time to figure out what to do next. We thought we would head for Dupont Circle, but the crowd flow forced us basically in the opposite direction. We were jammed with thousands of people on the corner of 14th and Independence for the longest time. As we waited, we saw the presidential helicopter transport the Bushes to Andrews AFB, to begin their retirement. Bon voyage! We finally decided that the best thing would be to walk to a further-out Green Line station, so we continued down 14th Street to Maine, and walked along the water to the waterfront. We briefly considered stopping there for lunch, but the line out Phillips Restaurant was LONG. We walked past the Waterfront-SEU station, but it was mobbed all around the block. So we continued another half mile or so to the Navy Yard station (where the Nationals Ballpark is), got into the station easily, got on the first train that came, and even got seats on the train. Hooray! When we got back to Silver Spring we stopped and had Thai food as a late lunch. There was a TV on, and we were surprised to see that the parade was just starting (it was 3:30 pm at this point). We finally got home a little before 5 p.m. What an adventure! But totally worth it. Hi everyone! The blog is up and fully functional. Please check out the pictures at http://www.flickr.com/photos/nocureforgravity/collections/.